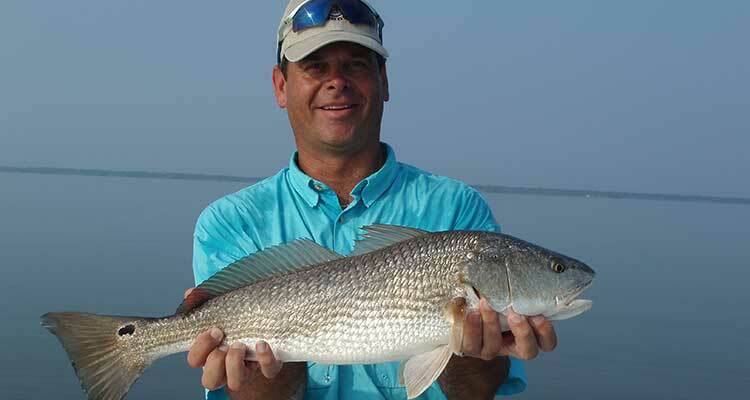 Mosquito Lagoon is world famous for Redfish and Speckled Seatrout fishing. Located in the northern part of the Indian River Lagoon System, it is a well-known destination for birdwatchers and nature tours. The Indian River Lagoon has more species than any other estuary in North America and the most diverse bird population in North America. Capt. Karty has guided in Mosquito Lagoon and the Indian River Lagoon since 1992. 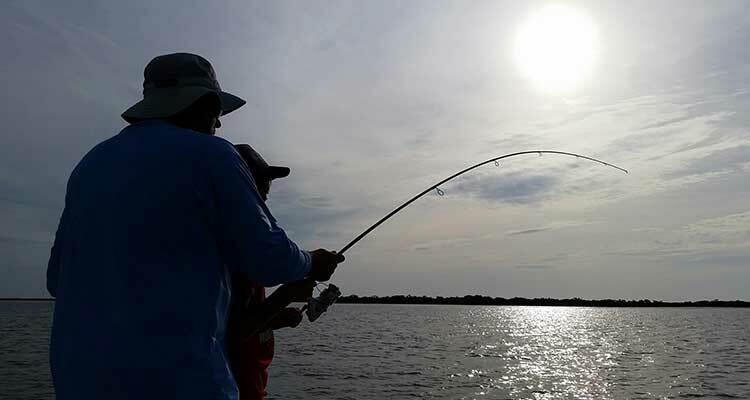 He has learned that the best fishing spots in Mosquito Lagoon change with the conditions. He recommends a start time of daybreak for most trips. It is the most beautiful part of the day out on the lagoon. Priceless. An estuary is formed when saltwater from the sea mixes with freshwater from the land. Mosquito Lagoon is located in the northernmost part of the Indian River Lagoon and has a width that varies from one half mile to five miles. The waters of Mosquito Lagoon are influenced more by the wind than tidal forces and do not flow like a river. The majority of the islands were created when mangroves seeded oyster beds. Birds visit the islands and drop seeds distributing the diverse species collection around the lagoon. 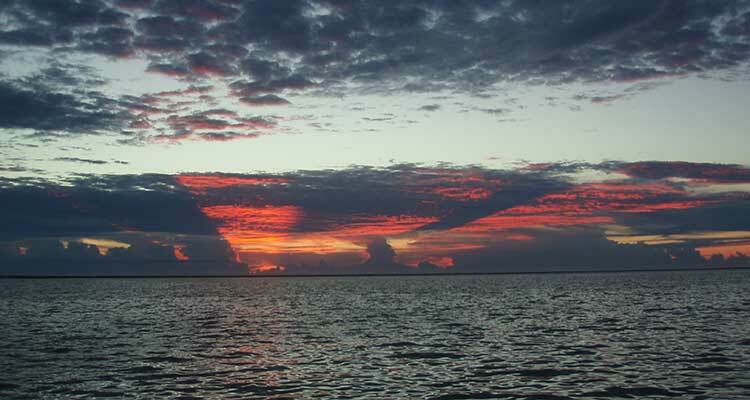 The islands of Mosquito Lagoon range from less than one acre to several hundred acres in size. Smaller islands fall victim to freezing temperatures which kill its plant life. Without the plants, the islands wash away over time. Larger islands are home to old oak trees, many varieties of palms and red cedar trees. Mosquito Lagoon was home to Timucuan and Ais Indians dating back to 10,000 B.C. The rising sea level has covered many of their settlements. Mosquito Lagoon has attracted recreational activities since the late 1800s when it became busy with steamboats. Railroad lines led to motels in New Smyrna Beach. With names like Shotgun Island, Orange Island and Whiskey Point it is not hard to imagine the locals being mostly fishermen, orange growers, bootleggers, pig farmers and American Indians. Mosquito Lagoon is known as the most notorious point of entry for bootleggers on the entire East Coast of Florida. Boats from Scotland, England, the Bimini Islands and Cuba were pulled across a narrow strip of beach land just across from Oak Hill, Florida. Bootleggers would stash their bottles of liquor on the islands until it was safe to transport their wares. Islands were known to have moonshine stills and some were quite famous for their size. During and after prohibition, bottles were found on Bottle Island, located in northern Mosquito Lagoon. It is claimed that a group of fishermen fought on Bottle Island leading some to refer to it as Battle Island. Shipyard Island is the largest island in Mosquito Lagoon. The north tip came to be called Last Chance, which provided the last opportunity to scrape barnacles or make repairs before reaching Hallover Canal. It is said that American Indians stored their canoes there. Confederates used the island to build ships during the Civil War. Island residents planted orange groves there in the early 1900s. Orange Island was named for the largest orange grove in the area at that time. Locals claim it once boasted a large plantation described as elegant. A group of islands was named for the sound made by dredged corals and sand moving through the dredging pipes. Still referred to as The Clinkers, the younger islands have less vegetation than the older islands and are an important habitat. North of The Clinkers is Shotgun, a group of flat islands whose shape resembles a shotgun barrel. 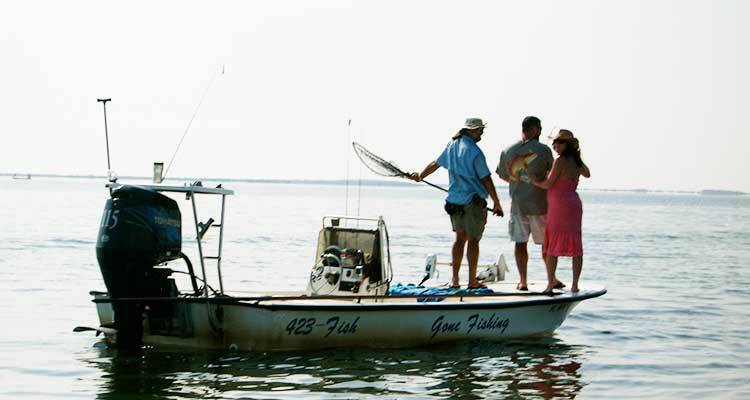 If you like to fish, we found a great guide to take you back water fishing. His name is Capt. Karty Sills. He was very patient with the four of us including our 6 year old daughter who did not know how to use a fishing rod. The fishing was good, the wildlife was spectacular including seeing Manatees next to the boat. 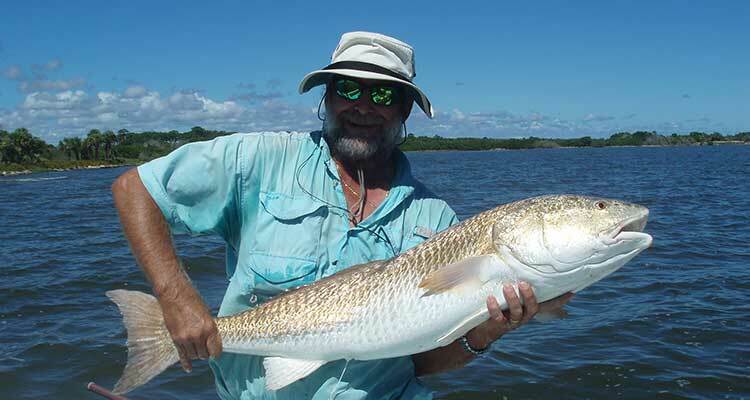 He knows the best places to go for Red Fish and they taste great. -Joann Bason, Mill Hill, Penn. Karty was right on time – very personable & knowledgeable about Mosquito Lagoon. Kept us moving looking to help us catch some fish. We had a great time and will recommend him to our friends. All the islands of Mosquito Lagoon are important nesting areas for birds. The lagoon is spawning and nursery ground for both ocean living and lagoon fishes. Mosquito Lagoon is home to at least 36 rare and endangered species and four species of fish that breed only in the Indian River Lagoon System. Species of bird-of-prey include Hawks, Falcons, Osprey, Vultures, and Owls. Osprey nests are regularly seen near the river in dead trees. They are reused year after year. Spotting Vultures flying high above the islands looking for a meal is a common occurrence. The islands are full of small mammals including Weasels, Raccoons, Mice, Muskrats. Larger mammals occasionally include deer, wild hogs, or panthers. Armadillos are often spotted swimming between islands. Bottlenose dolphins and manatees represent the marine mammals. Shorebirds including Herons, Egrets, Spoonbills, Pelicans, Loons, Ibis, Kingfishers, and Cormorants all depend on Mosquito Lagoon for food. Birds that can be spotted while hiking on the islands include Woodpeckers, Mockingbirds, Doves, Cuckoos, Ducks, Geese, Quail, Turkey, Sparrows, Warblers, Sandpipers, and Hummingbirds. Gulls and Terns are always scavenging, ready for a fish carcass or dead bait. 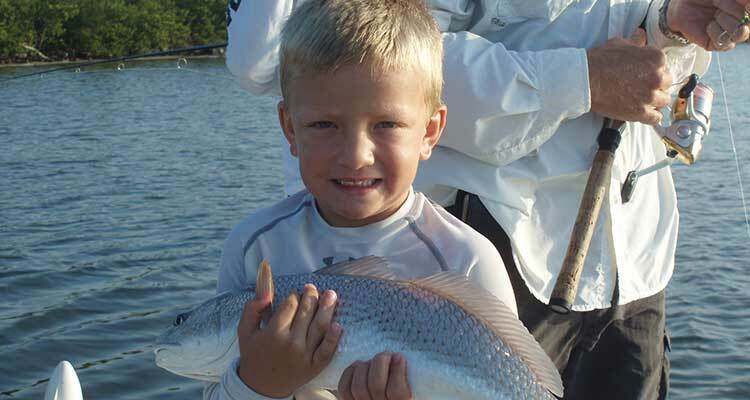 Game fish species in Mosquito Lagoon are Red Drum, commonly known as Redfish, Spotted or Speckled Seatrout, Snook, Ladyfish, Flounder, Black Drum, and Tarpon. Alligators, Turtles, Tortoises, Fiddler, Horseshoe and Blue Crabs also inhabit Mosquito Lagoon, while Shrimp, Clams and Oysters each play an important part of the food chain.